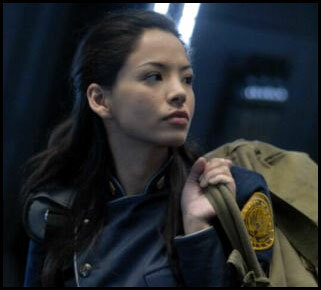 Battlestar Galactica: Razor was a very unusual project to work on. While it is being promoted as a TV movie, or “event,” it’s essentially a lost chapter from Season 2. So, I found myself returning to characters and storylines from many episodes past, with the experience and sensibilities I’d acquired throughout Season 3. The story is rather fragmented, and gives us many layers of flashbacks and back-story for several characters. Much of the film focuses on the Battlestar Pegasus and Admiral Cain’s escape from the initial Cylon attack. We get to witness firsthand events that were only described in dialog in the Season 2 episode Pegasus. My first inclination was to bring back some of the rock-inspired sounds of that episode’s score. However, when I watched a rough cut of the film I realized that all of the flashbacks and diverse storylines actually hinged on a new character, Kendra Shaw. Kendra serves as our narrative voice, and we witness most of the events through her eyes. It was instantly clear that the music I had composed for Pegasus would be woefully inappropriate for Razor. Virtually the entire score is constructed around a simple theme I wrote for Kendra. I wasn’t very subtle about using it either. I wanted to help cement the film’s narrative to her character, so this theme comes pretty close to hammering you over the head throughout the entire movie (at least as close as any theme does on this show). With the Kendra Theme providing the bulk of the dramatic material, I was free to explore the most exciting sequences in Razor, which are of course, the big battle scenes. The first one is the Cylon attack on the Pegasus, and it is my personal favorite. I had unrealistic intentions of keeping the music very minimal here, to make room for the inevitable onslaught of explosions and gunfire sound effects. So, the music in this scene is very simple. The shime daiko and nagado daiko pound out a relentless 6/4 pattern while the orchestra and soloists play a chant-like drone of Cm – Ab – Ebm – Db. The rhythmic pattern literally never changes and the harmonies only break free of their pattern for a couple bars towards the end. Yet, somehow this cue ended up being one of the hugest and most epic I’ve ever written. I’m honestly not sure how it happened, but that’s the fun of working on a show like this. You can surprise yourself. Several of the other stand-out musical cues will only be heard in the DVD version of the film (the superior version in my opinion). The end of the DVD cut features an extended monologue montage, which has some great guitar work by Steve Bartek. Also, there is another flashback that includes a snippet of my theme for Admiral Cain. 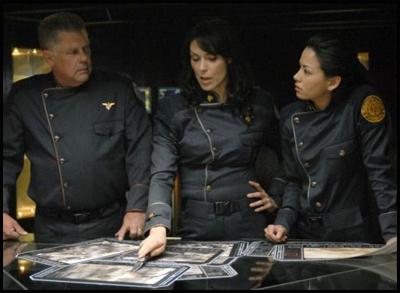 The Young Adama flashback is really impressive on DVD and I pulled out all the stops for it. The battle sequence features ship-design from the original 1970′s series, so the score includes a triumphant brass statement of Stu Phillips’ classic Battlestar Galactica theme (making it’s first appearance since the Season 2 episode Final Cut). Unlike Final Cut‘s “Colonial Anthem” arrangement, this version needed to function as score. So, the brass fanfare is now playing against the full arsenal of taiko drums and ethnic soloists that embody the sound of the new Galactica. Not surprisingly, when the original Galactica theme is set against pounding taiko drums the result suddenly brings to mind Basil Poledouris’ score to Conan The Barbarian. This is, admittedly, not a coincidence, since that score is one of my favorites. In fact, the Husker battle cue in Razor features 24 tracks of French horns, as a reference to the Conan Main Title, which was scored for 24 horns, strings and percussion. It’s not a detail that I expect any Galactica fans to catch, but hey… I think it’s cool. Towards the end of that space battle, there is a tragic moment where the duduk plays a sorrowful version of Stu Phillips’ theme, set in minor mode. After I scored this sequence, Stu told me he can’t recall ever using the theme in a purely minor mode… so this moment in Razor might be the first time it’s ever been heard that way! I’ve gotten a ton of email requests about the soundtrack for Razor… and it hasn’t even aired yet, so I’m sure I’m about to get a lot more. As I mentioned in my FAQ, there will NOT be an immediate soundtrack release, though I haven’t ruled out the possibility of releasing it later. However, the best cues will be included on the upcoming Season 4 CD. 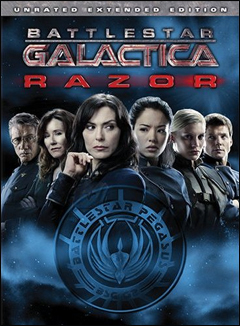 While it may not push the grand story forward, Razor serves as a great way to get your Galactica fix before the long-awaited Season 4 premiere in April. In the coming weeks I’ll be posting an official concert date for my next Galactica score concert, which will also be in April. Also, keep your fingers crossed that the Writers Guild strike ends soon… or else there’s little to no hope of seeing the incredible conclusion of Battlestar Galactica before 2009. PS: By the way, I’ve already seen the first 10 episodes of Season 4 and… it’s frakkin’ incredible. Totally worth the wait!